Oh, just me shattering the Compact, by buying a brand-new king-size bed today. See, there needs to be a rider to the Compact to account for spouses that do not wish to follow the Compact. It’s a long story but basically a decision was made to move our current, queen-sized bed to another room and to get a new bed for our room. We have long wanted a king-sized bed to accommodate the children that find their way into our room in the middle of the night. I tried looking at Craig’s List for a bed (our current queen came from there), but there weren’t many kings and also not many pillowtops. And I will never go back to a non-pillowtop mattress. Then my husband starting getting a case of the ickies, talking about bedbugs and human secretions. So it was off to Macy’s furniture store. He was too busy to go, so I did the testing and purchasing. I just hope he likes the bed because he does have a bad back. I need a chair or loveseat for the family room. I have been trying to revamp this room ever since we moved in eight years ago. This year I finally got a custom slipcover made for the couch, because the original covering was completely shot. So I feel good about that because I love the couch, I love the new look, and I kept the couch out of the landfill. It’s not a frugal victory, but a green one, at least. 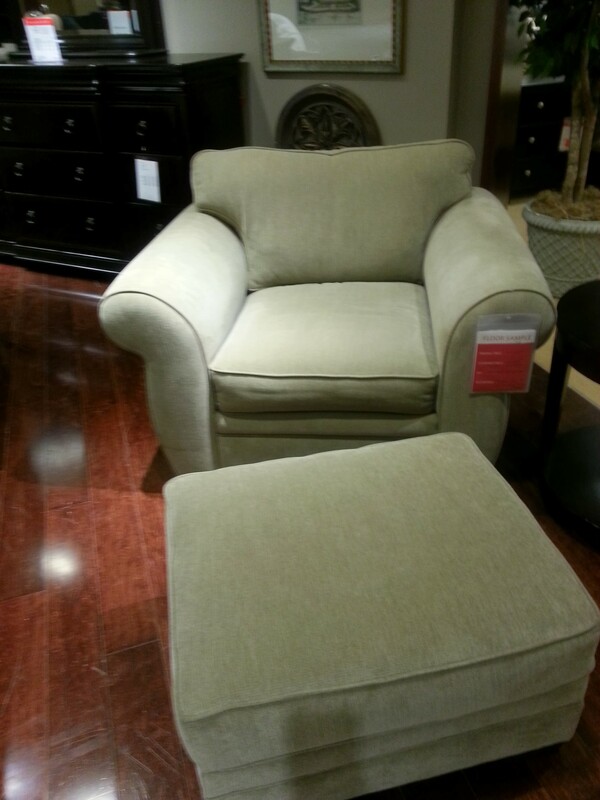 However, I can’t bring myself to spend that much to recover the loveseat. It needs to go in someone’s dorm room or man cave. Soooo… the chair is on hold and I’ll let you know if I do go back tomorrow and get it. I suppose I could look into where it was made, what Macy’s practices are, etc. That might make me feel better about buying new. I feel much much better today and it was great to finally get out of the house. Dinner was pork chops, corn, mashed potatoes and leftover egg noodles, all popular in this house. But more importantly, it was a pleasant dinner with minimal antics. I need to try to remember to start sneaking cauliflower in mashed potatoes. I also picked up lunch at a yummy place located in our downtown. One of these days I’ll post more about our downtown, why I love it and how it fits into my interest in frugality and simplicity.